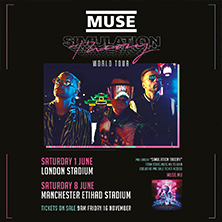 Muse are an English alternative rock band from Devon, comprising of singer and guitarist Matthew Bellamy, bass guitarist Christopher Wolstenholme and drummer Dominic Howard. Muse concerts are renowned for their energy and extravagance. They are known for their blend of many different music genres but have a very distinctive, unique sound. Their award-winning albums include Showbiz, Origin of Symmetry, Absolution, Black Holes and Revelations and The Resistance.